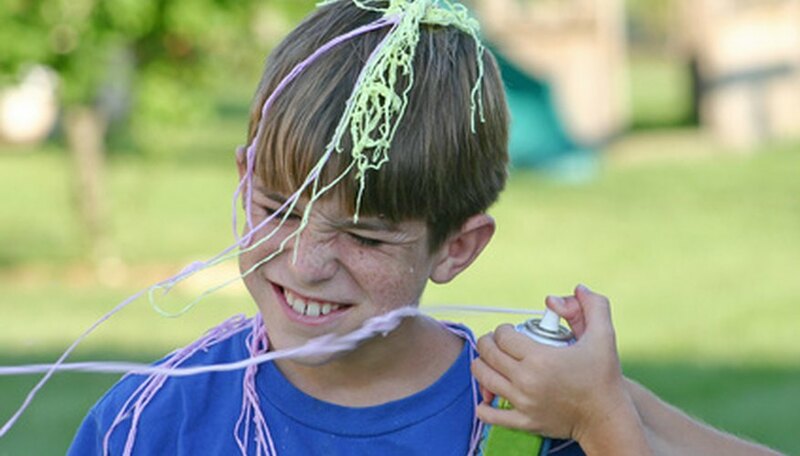 Silly String is a canned aerosol streamer that begins as a liquid inside the can and comes out in a long, stretchy, slightly moist string that will stick to most substances. The string sets into a solid while in midair. Silly String can be difficult to clean up when the contents have been sprayed all over an area. If the string is outdoors, it can be easier to clean up and dissolve. Fill a spray bottle with equal parts water and mineral spirits. Spray a small amount of the solution directly on the Silly String. Use just enough solution to get the area slightly wet. Allow it to set for a few minutes. Reapply as necessary until all of the Silly String has dissolved. Protect all furniture, carpets and vehicles before you spray the Silly String. Using the string outdoors will make cleanup easier. Mineral spirits is often used as a milder form of paint thinner. It can cause eye and skin irritation. Test the mineral spirits on a swatch of fabric or in an inconspicuous area before using on large areas of carpet and upholstery.